Kindness, My dad was kindness person I have ever known. He was giver of time, money and service. He taught me when you give, you are truly blessed. When you pay it forward you are really blessed. You feel better. When you serve others, you are the one who gets the reward. My dad knew the power of kindness. The magic formula for putting more joy into your life can be summed up in one word - kindness. Just by performing random acts of kindness and helping people in need, you can bring joy to your own life, as well as the lives of others. Whether you choose to volunteer, give aid to those who have been affected by recent natural disasters or simply share this movie with others, you are starting a chain of random acts of kindness that has the potential to transform the world. 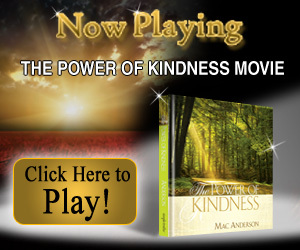 Click below to watch this life-changing movie, and don't forget to pass it along so others can experience the power of kindness. A good character is the best tombstone. Those who loved you and were helped by you will remember you when forget-me-nots have withered. Carve your name on hearts, not on marble. ~Charles H.
Charles Plumb was a U.S. Navy jet pilot in Vietnam. After 75 combat missions, his plane was destroyed by a surface-to-air missile. Plumb ejected and parachuted into enemy hands. He was captured and spent six years in a communist Vietnamese prison. He survived the ordeal and now lectures on lessons learned from that experience! Vietnam from the aircraft carrier Kitty Hawk. You were shot down! Plumb couldn't sleep that night, thinking about that man. Plumb says, "I kept wondering what he had looked like in a Navy uniform: a white hat; a bib in the back; and bell-bottom trousers. I wonder how many times I might have seen him and not even said, 'Good morning, how are you?' or anything because you see, I was a fighter pilot and he was just a sailor." Plumb thought of the many hours the sailor had spent at a long wooden table in the bowels of the ship, carefully weaving the shrouds and folding the silks of each chute, holding in his hands each time the fate of someone he didn't know. Now, Plumb asks his audience, "Who's packing your parachute?" Everyone has someone who provides what they need to make it through the day. He also points out that he needed many kinds of parachutes when his plan was shot down over enemy territory - he needed his physical parachute, his mental parachute, his emotional parachute, and his spiritual parachute. He called on all these supports before reaching safety. Sometimes in the daily challenges that life gives us, we miss what is really important. We may fail to say hello, please, or thank you, congratulate someone on something wonderful that has happened to them, give a compliment, or just do something nice for no reason. As you go through this week, this month, this year, don't forget to recognize the people who pack your parachutes. The story about Charles Plumb is just one of those shared in my book, The Power of Kindness. More than anything else, kindness is the one way you can be assured of making a difference with your life. Practicing small acts of kindness changes your own life while also changing the lives of others. Leo Buscaglia said it best: "Too often we underestimate the power of a touch, a smile, a kind word, a listening ear, an honest compliment, or the smallest act of caring, all of which have the potential to turn a life around." It's my hope that The Power of Kindness inspires every person who reads it to perform one random act of kindness they wouldn't have otherwise. Those little ripples will turn into a tidal wave that will make the world a better place.